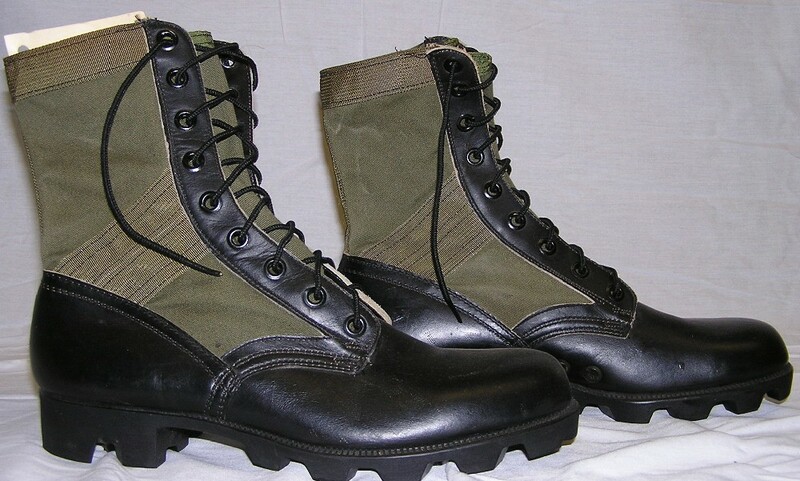 There are seven basic "patterns" of boots used during the Vietnam War. There are two versions of the all leather combat boot which was the principal boot worn when US troops deployed to Vietnam. 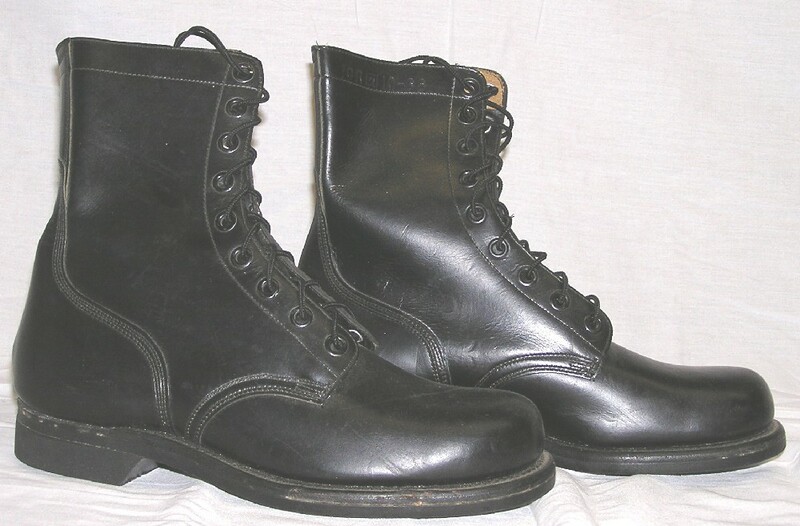 The leather boots saw continued use through out the war in rear areas, aviation, and other circumstances where a nylon boot was not desirable. 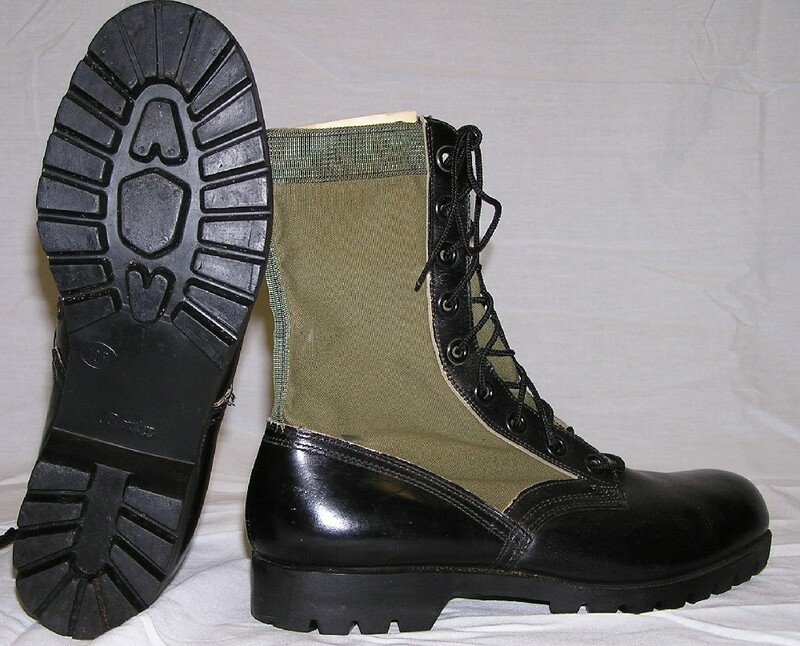 There are five basic styles of Tropical Combat Boots or "Jungle Boots" starting with the Okinawa Boot and moving on to the 1st, 2nd, and 3rd Pattern (in both Vibram Sole and Panama Sole) Jungle Boots. The boot that most troops deployed to Vietnam with. This was the most common footwear in Vietnam in 65 and early 66. 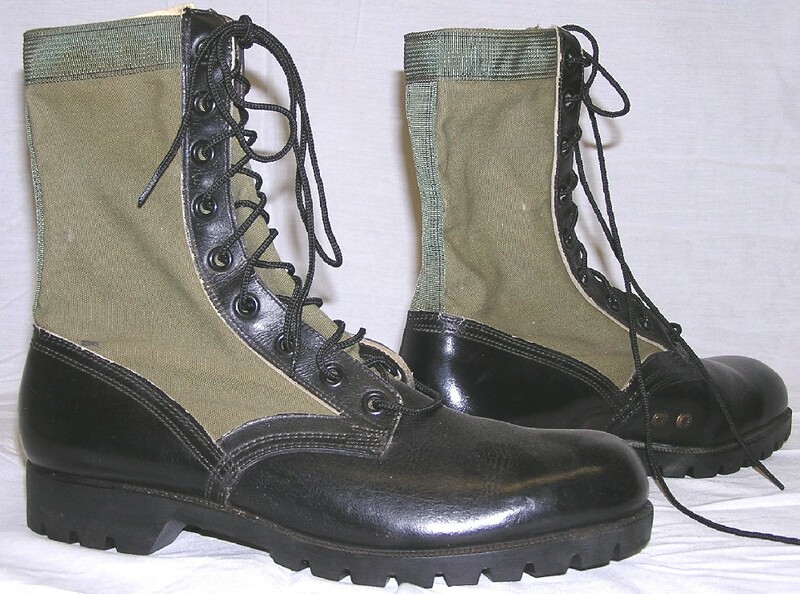 As jungle boots increased in supply, the leather boots were relegated to rear support areas and to aviation personnel (to reduce risk of injury in event of a fire). 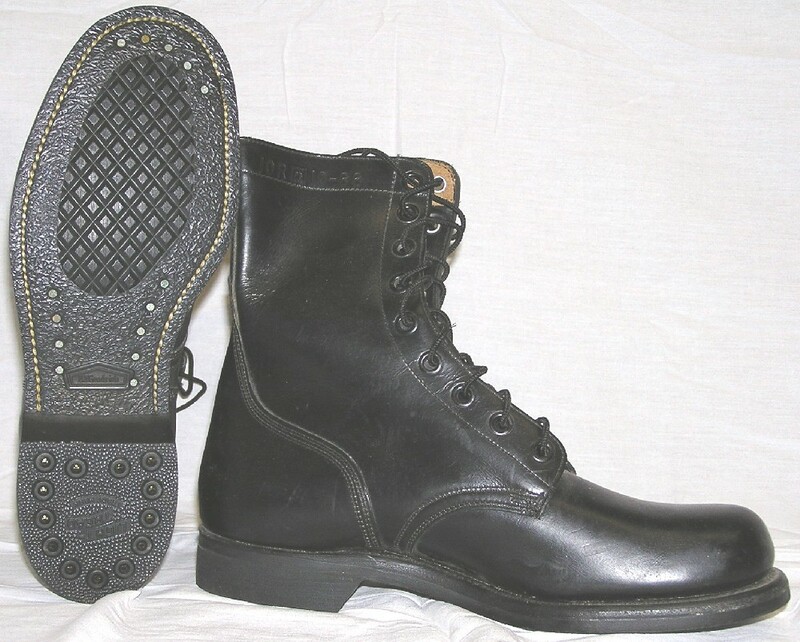 The early "McNamara" Boots (first two pictures, bottom boot) featured a stitched on sole that was relatively smooth with a small diamond tread pattern around the ball of the foot. The direct molded vulcanized sole came out in 1967 and often referred to as "Ripple" pattern sole (third and fourth photos). 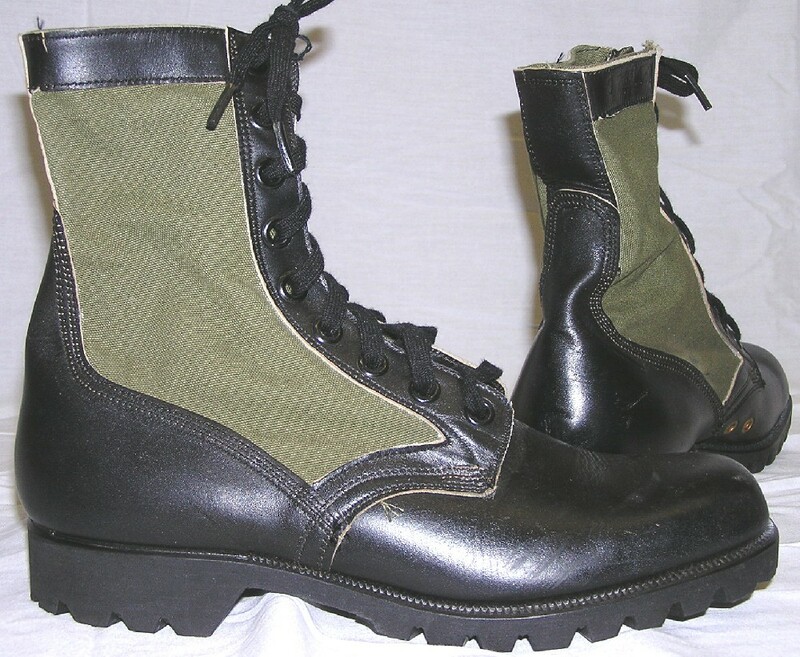 These were made in the 1950's and are the US Army's first attempt at a modern jungle boot. The boots are basically WWII Double Buckle boots that have been redesigned with canvas parts for tropical climates. 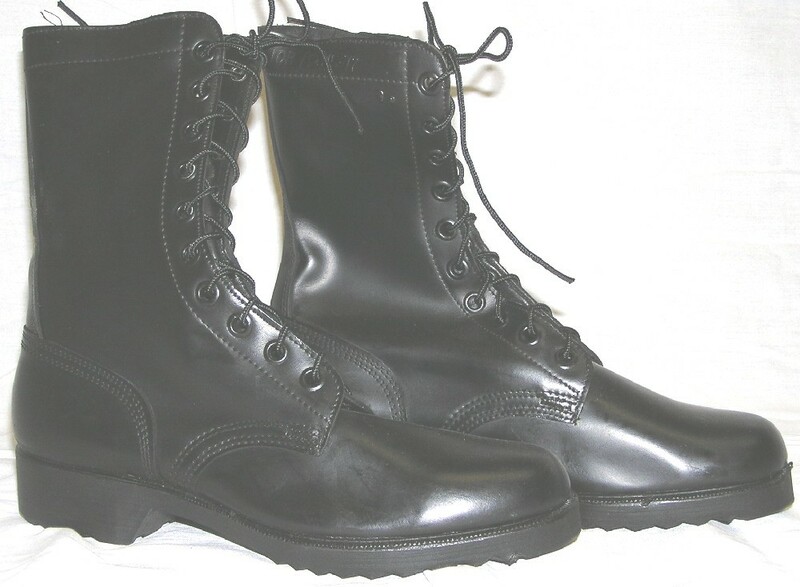 The boots are often seen worn by early advisers who departed for Vietnam from Okinawa, hence the name. 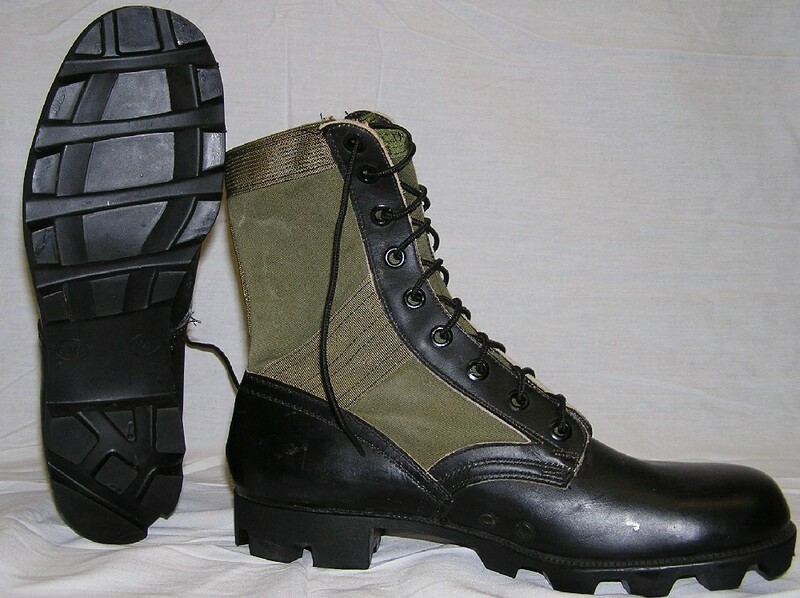 At this point, the lug soles were still stitched to the body of the boot. There is some discrepancy as to when these were released, but the pair pictured below are NOS and clearly dated 1962. The date is located on a white tag that is sewn into the tongue of the boot. 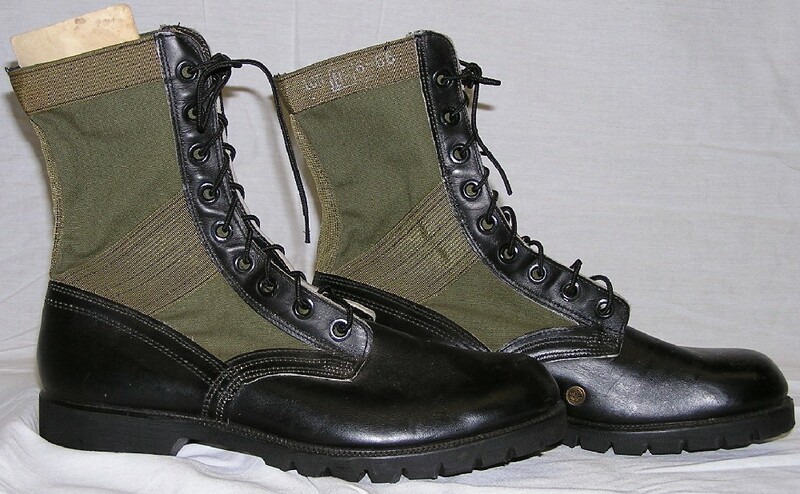 They were the basic "black leather and green canvas" of all of the VN era boots. However, they were distinctive in that they had a leather band at the top of the boot and a leather backstay that ran from the heel to the top of the boot. They also lacked the nylon ankle reinforcing band of the later style boots. The first pattern boots featured the first DMS (Direct Molded Sole where the sole was bonded to the upper in a vulcanization process) sole in the Vibram pattern. This was an improvement over the first pattern in that the top band of leather and the backstay running from the ankle to the top of the boot were changed to nylon. At this time, the boots still lacked an ankle reinforcement. As for the time introduced, once again there is no "perfect date", but the earliest pair that I have personally seen were July 1965 dated. The pair shown below are June 1966 dated. 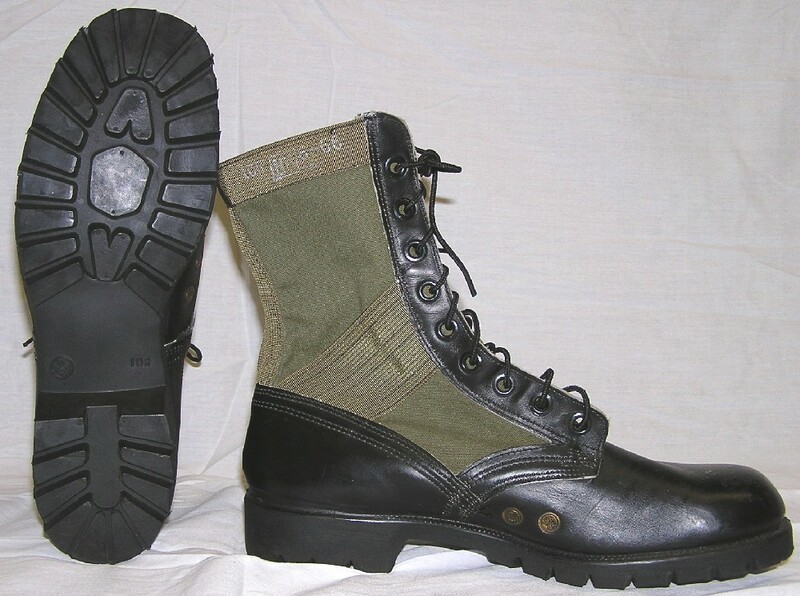 This boot also featured the same Vibram Pattern Sole as the First Pattern. 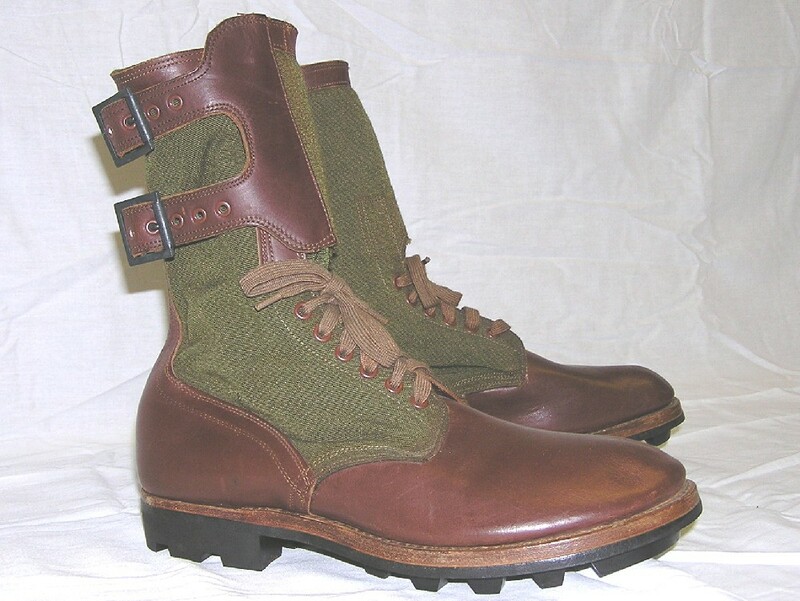 This boot featured the same all cotton upper construction like the first and second pattern, and the second pattern's nylon backstay reinforcement and top binding. The most noticeable difference is the addition of a nylon ankle reinforcing band. 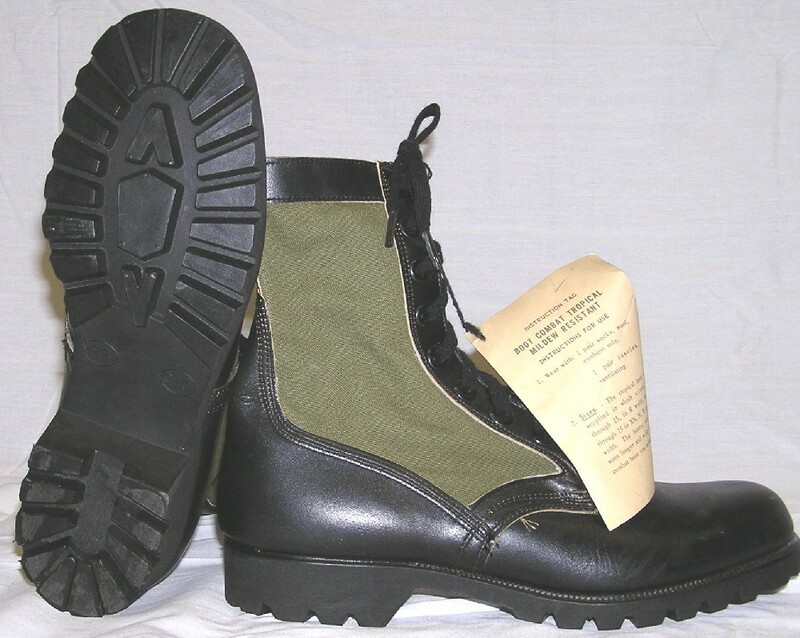 These boots were first issued with the same Vibram Sole of the first and second model jungle boots. However, they were improved in 1966 with the introduction of the new Spike Protective Sole which consisted of a steel plate bonded into the footbed of the DMS Vibram pattern sole. The earliest pair of Third Pattern Jungle Boots with the Vibram sole that I have personally seen were dated November 1965. The latest pair that I have seen were March 1968 dated. Despite the switch to the Panama Sole production in the late 1960's, the vast stocks of jungle boots in Vietnam were Vibram sole and they are far more commonly found than the Panama Sole. 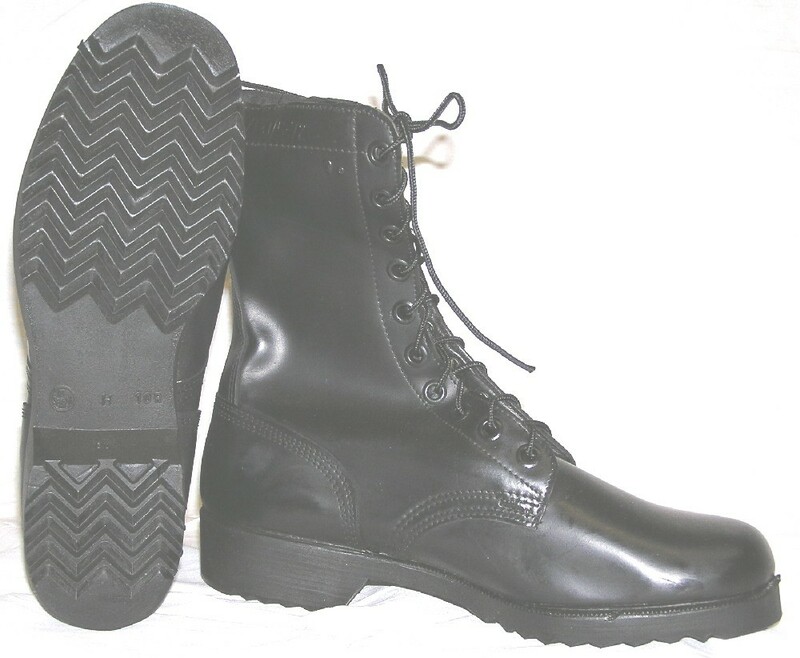 The upper of this boot is identical to the Third Pattern Jungle Boot with the Vibram sole, except that it has the Spike Protective Panama Sole. The Panama Sole with spike protection was approved in 1966 along with the new spike plate being added to the Vibram sole, but does not seem to be used on production boots until mid 1967. The delay is likely a result of the extensive process required to make new molds and the fact that manufacturers still had existing contracts for the old sole. The pair shown below are the earliest that I have seen and are June 1967 dated. 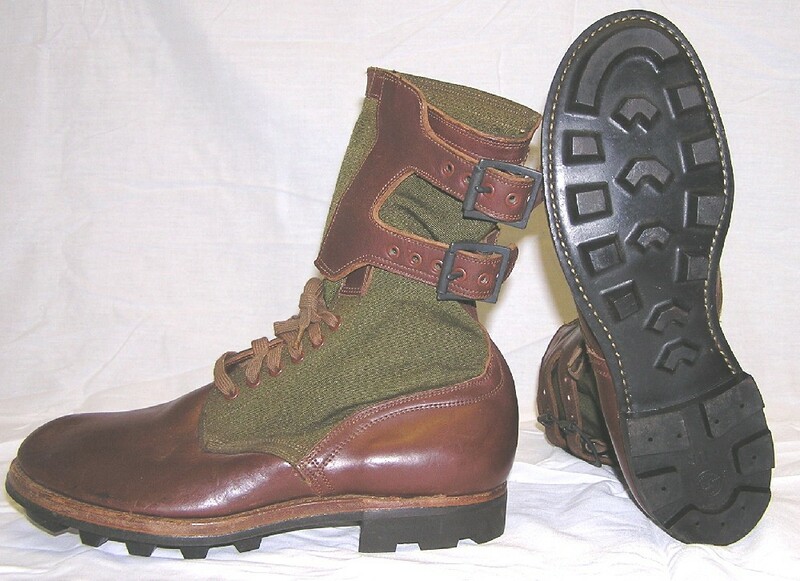 However, it is not uncommon to see boots from Late 1967 and early to mid 1968 with Vibram soles as well (see above). From 1969 on, production is exclusively Panama. Despite these production dates, the Panama sole never reached the issue numbers of the Vibram during the Vietnam War and are not as commonly seen. When shopping for leather boots, check to make sure that the boots do not have a "notched" relief cut in the lacing area at approximately ankle height. 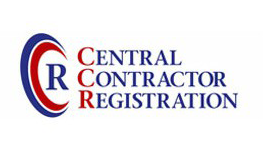 When shopping for Jungle Boots, check the tongue of the boot or the reinforcing band at the top of the boot for an ink stamp that includes the date of manufacture. If this stamp is worn, check the heel of the boot for a short stitch line running perpendicular to the sole. The vast majority of VN era boots have this stitch, but it is not a 100% guarantee that all boots with the stitch are VN era as I have seen post war boots with the stitch dated as late as 1980. As a side note I have seen several pair of late 60's dated boots made by Endicott Johnson Corp that do not have the stitch.